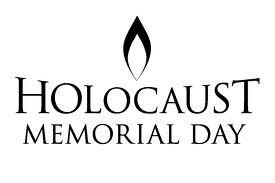 Today is Holocaust Memorial Day around the world. At the UK’s Holocaust Memorial Day Trust website you can touchingly light a memorial candle. Please do! I offer the following reflection on my own journey of emergence from the shadows of fear and hatred which came from being raised by parents who had been forced to flee from the fury of the Holocaust. It might be more accurate to classify my parents as Holocaust escapers rather than Holocaust survivors. Although they were Jews caught up in the terror of Nazi Germany they never went through the hell of Auschwitz or the other death camps. My mum escaped to England after Kristallnacht and then gamely faced the blitz alongside the Londoners whose spirit she so deeply admired. Her then fiancé – my dad – escaped to Hungary only to find that their decision to ally with the Axis powers consigned him to a forced labour camp as a human minesweeper on the Russian front. When he and his fellow “labourers” incredibly managed to escape from their German and Hungarian guards to the Russians, instead of liberating them they sent them to Siberia as potential German spies. After the war dad had to bluff his way onto a train to get out of the camp and he managed to get out of Russia, back to Budapest, and then across to Britain to marry my mum. They were reunited after eight years of painful separation, despite the best efforts of Nazi ideology to wipe them both off the face of the planet. So I am lucky to be alive. But I didn’t feel lucky to be alive from the first day it dawned on me, as a six-year old, that I was not actually living in a Jewish country, despite an environment that seemed to say otherwise in Golders Green, the North-West London area I grew up in. Over the next few years I heard chilling rumours of my forebears being turned into soap and other stories that didn’t allow much room for rose-tinted optimism about my prospects. I never contemplated suicide, but as a sense of the enormity of the Holocaust sunk in I found myself silently wishing I had never been born. My thoughts remained that way from about eight to twelve years old. 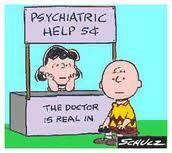 My greatest joy over those years was collecting Peanuts cartoons, and Snoopy’s pals played a part in my transition out of that doom and gloom mentality. I had a spiritual experience when I saw a poster of Lucy confidently – if illogically – assuring Charlie Brown that the world couldn’t end ‘today’ because it was already ‘tomorrow’ in some other countries. Despite the rationality of the Charlie’s-eye view of the world, something just clicked for me. I didn’t immediately lose my dread of a recurring Holocaust – or, indeed, my fear of potential nuclear holocausts, which was society’s big fear during my formative years. But at that moment I felt, intuitively, that there was actually a God somewhere out there, caring. I found myself opting for optimism instead of pessimism. My next few years were more optimistic, but not without the kinds of challenges that all non-cool kids face during the High School years, compounded by the fact that I was unusually short for my age and looked even younger than I was. I couldn’t get a girlfriend. I was forced to play rugby when I preferred soccer. I was okay at my school work without ever shining at it. I started to skip classes and took to gambling instead. I hit that second transitional moment when I left school at eighteen. Just before going off to University my parents took me for a medical diagnosis of my small stature, and the verdict was blunt: I would barely grow, if at all. The devastation I felt from the finality of the specialist’s words kept me awake into the wee hours, until a moment of prayer dissolved it. I don’t mean formal prayer. I didn’t know any. My family was not that religious and at thirteen years of age I had even refused to have a Bar Mitzvah. This was the kind of prayer where one moment you are full of inner turmoil and the next moment you catch a wordless glimpse of a deeply loving presence and feel totally at peace, the anxiety all gone. That peace brought a change of mind and was prescient of a change of body – that I have since felt was related to that mental shift. I rapidly grew after that night. Four years later, just as I was leaving University to launch into the rest of my life, I was introduced to Mary Baker Eddy’s Science and Health with Key to the Scriptures. To my logical mind, as a Mathematics graduate, this book on the how of the healings attributed to Jesus and his early disciples convincingly explained what had happened to me on that night when, at the very minimum, I had been freed from deep distress at a medical verdict hanging over my future. So I immediately wanted to explore its ideas more. Christian Science is often caricatured as ignoring evil – as I soon learned through misleading Christian tracts which washed up on my doorstep (and which, more recently, appear in Google searches) and through disappointed reading of lazily researched academic works. As the child of Holocaust survivors, ignoring evil is not an option. I wouldn’t have touched Christian Science with a barge pole if it did that. When I first read Science and Health I was living with the fear of evil breathing down my neck, because of a surge of racist and anti-Semitic right-wing activity in England in the 1980s. Fascist violence was not an abstract concept to me in my early twenties. Believers in it were turning up at the rock concerts I was attending and threatening the anti-racism marches I went on. Christian Science didn’t promise me a magic wand to instantly make all this go away, but it did offer me a way to grow beyond my own chronic fears and to make some progress in chipping away at the evils of this world through proofs of healing. At the time I was living with regular bouts of sinusitis from which I had suffered for many years, and which I had been warned to expect to experience throughout my life. Despite the best efforts of well-meaning doctors, anti-biotics prescribed to me had failed even to soothe the condition, let alone cure it, and had left me with uncomfortable side effects. When I had a spell of sinusitis after being introduced to Christian Science I decided to put its claims to heal to the test. I opted for thoughtful prayer instead of prescribed pills and studied ideas in Science and Health and the Bible in between my normal activities. For a couple of weeks I endured the pain I knew so well from previous attacks but with one solace: the joy of not suffering side effects from drugs…because I wasn’t taking any. What happened next has stuck with me ever since. I was visiting a Christian Science church – I was not yet a member at that point – and a friendly guy asked me if I wanted to get a bite to eat afterwards. Silently a voice in my head was screaming “No, I don’t!” because I was in too much pain to sit and socialize. However, another thought came to mind based on the commandment of Jesus I had been learning, namely to “do unto others” what we would have them “do unto us”. I thought, “You can always do the loving thing – and getting to know this individual is the loving thing to do!” So I did join him, and as we ate we chatted generally, and also exchanged some spiritual ideas. In that restaurant, that night, I had the most spiritual moment I have ever known. In Bible language you could say that the windows of heaven opened and poured me out a blessing that is just too beautiful and pure to properly describe. As clearly as I could see my friend across the table I felt the presence of God as Love with a capital ‘L’: a pure love, a perfect love, a boundless love. It was a love that loved me and my friend, and the restaurant’s waiters and manager, and the people they were serving, and the people passing on the street. I felt the presence of divine Love, loving everyone – whether Christian, Jew, Muslim, or non-believer – a Parent of all, who loves all equally, and has no favourites. The pain suddenly seemed totally separate from me. I knew I was healed. The sinusitis symptoms didn’t sap away immediately but they did so a couple of days later and they have never returned in two and a half decades since. As I saw it, a significant sliver of evil had been chipped away from my experience. Something more important than gaining that physical relief also happened as a result of my glimpse of spiritual love that night. 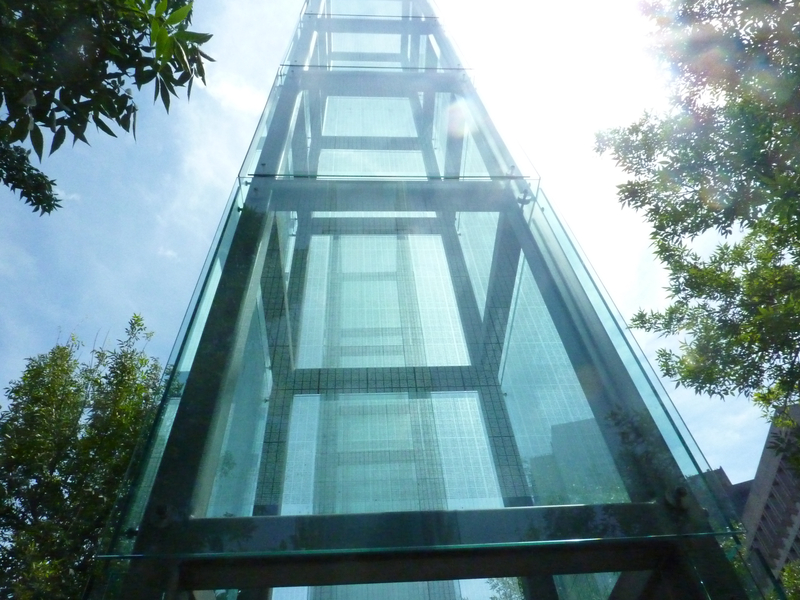 My fear and hatred of those who hate – specifically racists and anti-Semites – also began to sap away and my dread of a re-run of the Holocaust lost its tenacious hold on my thoughts. I was being transformed from being fearful about the motives and actions of others to harbouring a heartfelt desire to see them freed from what I could now see as a spiritual blindness. I was experiencing my own modest echo of what I feel Jesus must have felt when he was able to say of his crucifiers “father, forgive them; for they know not what they do.” I saw evil as an imposition on the better – truer – nature of men and women, as Christian Science teaches it to be. Beside yearning to see the end of hatred’s effects on those targeted by it, I yearned for everyone who judges by colour, or race, or denominational label, or any other material measure of a fellow human being to be free of such self-imprisoning thoughts. And I still do for their sakes as well as for the sake of ridding the world of the tragic outcomes when such warped thinking is allowed to gain momentum. Each year now, I attend an interfaith Holocaust commemoration in my community and I am always moved by the diversity of people joining the event. Good people of all faiths and of none show that they are determined not to let the memory die of what happened under cover of the Second World War so that it isn’t repeated. I stand with them in that. And, as many do, I also add my prayers to support whatever practical steps are needed to ensure there is no recurrence. Prayer has freed me from the fear and hatred that imprisoned me and I am convinced that such prayer can play a part in progressively helping to free humankind from all fears and hatred, including the evils of bigotry and genocide. 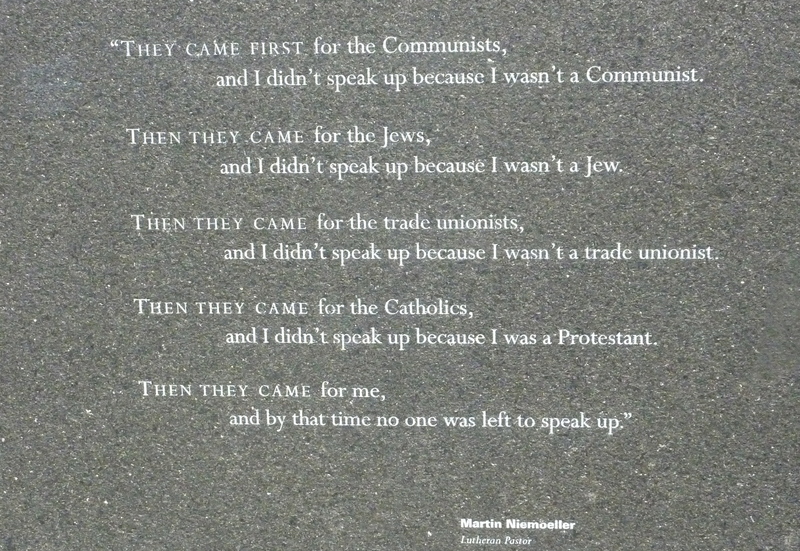 Visiting Boston’s Holocaust Memorial recently, I learned that author of the wise words of hindsight below – Martin Niemöller – was initially a supporter of Adolf Hitler before becoming an anti-Nazi theologian. ← Healing prayer narratives: Do doctors, prayers and miracles mix? Tony, this is a tender story, beautifully told. What brave people were your mom and dad! Your glimpse of universal love in the restaurant explains the great love and kindness with which you compile these blogs. I thank you, Tony, for sharing your experience as a son of a Jewish couple who escaped the Holocaust. We hear a lot of the stories of Jews who experienced the horrors of that, but seldom its effect on the next generation. It was very open of you to share the detail of your life, but so interesting to read of your spiritual awakening. and good to know of your complete release from the disquiet and problems of your youth through Christian Science. All this certainly now gives you a strong basis for effective healing prayer. This story was so moving. Thank you for sharing your spiritual growth. It really takes the wind out of your sails reading something like this when you feel justified in holding some minor grudge against someone! Thanks for sharing your story Tony. Today, I too, was at a simple but moving interfaith open air ceremony at an Anne Frank Memorial in a Bedford Park. Your account has helped me to put HMD into a more enlightened perspective. Tony, It’s hard to find the words that tell you how much I appreciated your story of the Holocaust. I feel that if I comment that I might degrade this fragile story. Once again, we can thank Christian Science. Thank you Sandi, Val, Susan, George and Don…I am moved that you are moved, and have shared that. Much appreciated. Thank you for sharing your story, Tony. You always inspire me, but this time you’ve touched a new place in my heart. Blessings on you. in the manner of Nathanael. What an inspired message to help start my day! Thank you, Tony. I too had one of those undescribable moments, more than 30 years ago, when a Christian Scientist I know sat me down to talk in a pretty complete way about God as Love. For me the experience gave a vivid glimpse of what lies beyond what we can see, and life hasn’t been the same since. Thanks for sharing your wonderful journey from fear to love. It reminds me of the time when Corrie ten Boom was able to forgive a German officer after WWII for all the atrocities he had committed. Your desire to help others be freed is the most most inspiring part of your story for me. Thank you. Thank you so much for your touching message. I read it when I returned home from my first Holocaust Memorial Dav service in Eastbourne which I attended because Malcolm Weisman, who was with you on the panel for “A Question of Faith” in November, was visiting from London to give the address. His brief remarks showed how humanity is scarred when it mistakenly believes that some are better than others, and fails to see God’s image in someone who is different. His question was not “Where was God?” but “where was man?” in failing to understand or rectify unjustice as your last quotation illustrates. I was impressed by how universal this service was, remembering not only Jews but victims of genocide in Cambodia and Rwanda, and how universal the prayers were reminding us that “everyone of us is made in the image of God and is of infinite worth to our Creator who has commanded us to love our neighbour.” The Kaddish, or Jewish hymn recited at funerals, was emphatically not a prayer for the dead but celebrating the sovereignty of God and looking forward. I have visited the memorial site in Israel, and your own insights brought things closer to home for me – as I taught many Jewish children for 6 years just next door to Golders Green (in North Finchley) and was often lifted by Snoopy. I kept a delightfully exuberant cartoon saying “If you can’t dance, at least do a happy hop!” Thank you again for your insights, and this very timely blog opening our thoughts to glimpse unlimited and ever-present Love and seek to express it better. Tony, what a fascinating and inspiring story. Thank you for sharing the high and low moments of your spiritual journey and the happy ending of your parents amazing escapefrom the Holocaust. Thank you Jan, Carolyn, Holly, Spike, James, Jean, Marion and KG for your supportive and expansive comments. James – yes, Corrie ten Boom certainly walked the talk on forgiveness, as well as being very courageous. Thanks Carolyn for the illuminating poem, and Spike for sharing that precious experience. Jean, I feel that what you are sharing just confirms what I felt when I joined Malcolm Weisman on the Eastbourne Interfaith panel – http://bit.ly/f2CWEM – that he is indeed a wise, humble and spiritual man. And, sure, KG, I would be honoured to have this circulated, especially among young people! I hope that can happen in the future. All the best to you all! Tony, I have just caught up with this – a little late, but what you share is timeless. It has really made me stop and think – as in pray. I’m touched, too, by the great sense of genuine humanity it has made manifest in those who have commented already. Moving, and very special. Thank you.